We assist our clients develop and implement a design that reflects their dreams and desires. We offer a free initial interview. At the initial interview, We show you our interior design portfolio, explain how we work with my clients, and how we would approach your project. We explain the fee structure, and how we can minimize your fee costs. Through the interview process, we seek to understand your objectives, time schedule, and budget. We provide references, on request, after the initial interview. We review the project and provide a free estimate of the design hours required, and of the cost. In the design process, we bring our interior design training, experience, and resources to your project. Our objective is to give you a finished product with a "designer feel" done to your taste and in your style. 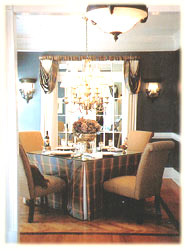 Throughout the design process, we offer you alternative designs, and ask you to select those that satisfy your tastes. You remain in control of the design process, the direction, and the final results achieved. We consult with you and with your contractor about the results we want to achieve, and we assist you and the contractor in planning and execution of the project, so that you get the results you desire. Call for information: 404-731-0844, or submit the request form below.